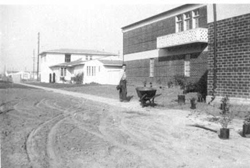 In the early twentieth century, farmland near the established city of Inglewood was chosen as the site for Loyola College to be constructed on land donate by Harry Culver. 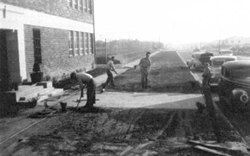 The college established education as a main force in the community and many developers became interested in the area. Simultaneously, the small landing strip known as "Mines Field" became Los Angeles Municipal Airport, beginning the move of airline companies to the region. As World War II drew to a close, veterans returning home from duty became attracted to the area known as Westchester. The major homebuilders, Silas Nowell and Fritz Burns, constructed single-family homes in the area south of Manchester and east of Sepulveda and offered them for sale with inexpensive terms for the veterans. Because of this, these first homes became known as "jeeps," and most are still standing today. Westchester grew quickly, as more neighborhoods were created at an alarming pace. Bishop Cantwell, who acknowledged this tremendous growth in this Westside area, realized the nearest Catholic churches were St. John Chrysostom in Inglewood and St. Mark's in Venice. He then proceeded to found four parishes in one year, 1943: St. Eugene, St. Joan of Arc, St. Timothy, and Visitation. Visitation was designed to serve the newly arrived defense workers and veterans, and their families. 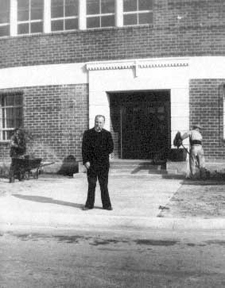 Monsignor Thomas J. O'Sullivan was named the founder pastor of Visitation, and he began masses in a garage in a house on Earhart Avenue until Visitation's new church building was complete! 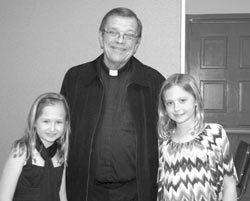 Realizing the importance of Catholic education and the educational nature of the Westchester area, Monsignor O'Sullivan established Visitation Catholic School in the fall of 1947 and placed it under the direction of the Sisters of Charity of Leavenworth, Kansas. Sister Joseph Cecilia served as Visitation's first principal, and the school quickly grew to an enrollment of over seven hundred students, with two classes per grade, at its pinnacle. Tuition was considered extremely reasonable, even at that time - for five children enrolled, the cost was only fifteen dollars per month! In June 1972, after more than a quarter of a century of dedicated service in educating children according to high Christian standards, these Sisters withdrew in order to meet more urgent commitments. Monsignor O'Sullivan, in his tribute to the Sisters, stated, "They had a spirit of enthusiastic seal and dedication to the highest ideals of Catholic education. [Visitation] became one of the outstanding grade schools in the archdiocese." In 1972, Sister Joan Patrice Clement, BVM, was appointed principal, serving the parish and school community with a dedicated lay staff. By the mid-1970s, the Los Angeles International Airport had purchased and removed nearly thirty-five percent of the homes in the Visitation Parish neighborhood, directly to the south of the church. While many of the displaced residents relocated to others cities and regions, Visitation continued to thrive with capacity-level classes and a vibrant congregation. 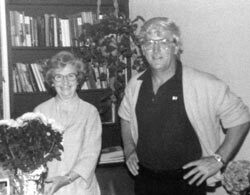 In 1980, Visitation experienced a change in leadership, with both Father James O'Grady beings named pastor and Dr. Carol Ann Crede appointed principal of the school. Throughout the following two decades, Visitation continued to provide an excellent education for its students, with high standards and positive, measurable results. A commonality throughout all of Visitation's history has been the dedication of its leaders. Several employees have served the school for more than a decade each, and there have been numerous former students who have returned to Visitation to join its faculty or staff. In 1981, Dr. Crede established the presence of the Sisters of the Religious of the Sacred Heart of Mary (RSHM) at Visitation, with Sister Perpetua Ledwidge and Sister Ellen Brown devoting many faithful years of education to the school community. Along with the faculty and religion coordinators of the school, Sister Perpetua also became a cornerstone of Visitation's religious education and Sacramental Preparation programs for over twenty-four years. 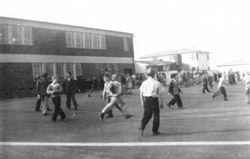 In 1988, the school expanded to include a Kindergarten level, which soon evolved into a whole-day offering. A full service child care center was also opened on the school campus during the 1980s and has grown to become a model for countless other schools' after-school care programs. Visitation has consistently received the maximum accreditation award from the Western Association of Schools and Colleges and the National Catholic Educational Association, and has been recognized by the Archdiocese and surrounding secondary learning institutions as a top high school preparatory learning establishment. During the 1990s, Visitation initiated a working relationship with Loyola Marymount University, one that has developed into a tremendous resource for both schools. Professional advancement for educators, guidance counseling, art therapy and administrative assistance have been integral components of this relationship, which has benefitted the students and staff of Visitation. 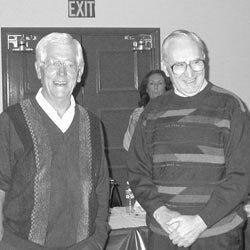 In 2000, Monsignor Timothy O'Connell was appointed pastor. After Msgr. O'Connell's retirement in 2009, Fr. William Brelsford was installed as the new pastor. The Junior Kindergarten program was introduced in the 2009/2010 school year to give Kindergarten aged children the extra "gift of time" to adapt and emphasize readiness skills. In 2010, Dr. Crede retired after 30 years as principal, and 38 years total at Visitation. For the 2010-2011 school year, Christopher Watson was appointed principal. Under Mr. Watson's Principalship, one of the biggest and most important changes at Visitation has been the implementation of the Common Core State Standards. As a Professor of Education at Loyola Marymount University, Mr. Watson saw and understood the true need to realign the current curriculum with these new standards. 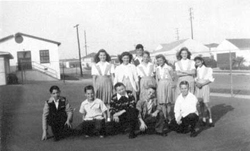 Additionally, Mr. Watson oversaw the building of a new playground; established a partnership with Loyola Marymount University and their Family of Schools; and he brought in innovative technology ideas including Smart Boards in classrooms, a redesigned Library and Media Center, and a ChromeBook pilot program. Visitation Catholic School presently educates approximately 250 students in grades Junior Kindergarten through 8th Grade and continues to be served by a dedicated and talented lay faculty, staff and administration.